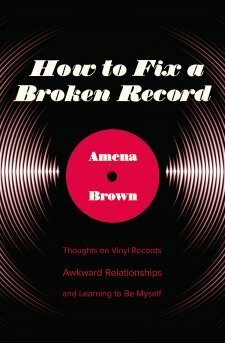 How to Fix a Broken Record Thoughts on Vinyl Records Awkward Relationships and Learning to Be Myself is the second book by Amena Brown. I was drawn to this book after hearing Amena discuss it on a few of my favorite podcasts. Her mix of humor, keeping it real, and boldly speaking the truth made me an immediate fan. I’m happy to say Amena’s personality shines on the pages of her book as much as it did while she was interviewed. The book is written in essay form similar to Tina Fey’s Bossy Pants. I love the balance of humor and honesty and each chapter Brown writes offers both. I found her presentation refreshing. As she discusses her wrestling with physical appearance, learning to love her hair and herself it felt like I was reading the story from a girlfriend I was getting to know better. Still, similarly to what happens when girlfriends chat, a truth-bomb would jump off the pages and how much God loves us or how when we find our identity in Jesus life looks brighter and I’d pull out my pen to underline it and think “Yes!”. I resonated with this book, chuckling as Amena reflected on her past and tearing up at parts of her current reality. I smiled as she wrote of marriage and laughed out loud a few times throughout. I think this book would be great for a college student or recent graduate, especially a woman “adulting” for the first time who is single. Although married now, Amena’s 20’s were spent single and that is becoming more common, yet not often written about from the perspective of a woman. In exchange for an honest review, I was given a free copy of this book via Book Look Bloggers. The opinions expressed are my own.